Hello. OOMPH! have a brand new album Ritual. What was the process of creating it? Dero: Hi! After our very successful last tour throughout Russia, we decided to go straight into the studio to keep all those positive emotions, vibes and all this power, energy and enthusiasm that we´ve had experienced there to transform it all into new songs. So, we´ve had some writing sessions and after about 3-4 weeks we´ve almost had 80% of the album written. So we added some ideas which every band member had been created alone at their home studio and the album was almost finished. Then, of course, the production and recording followed which took us almost one year as we´re doing everything on our own. Does the title have some background-meaning? What are the main differences to your former albums for you? The track Europa (for me the best track on the album) was done in cooperation with Chris Harms from Lord Of The Lost. How did this cooperation begin? Dero: Chris and I have been knowing each other for quite a few years and we were always talking about collaborations. Last year, Chris asked me to join one of their songs named „ABRACADABRA“ from their current album and I did so. It was a great pleasure and we had that much fun that I asked him if he could imagine to do the same on the next OOMPH! Album. As he agreed I send him the song and he was totally amazed. So he recorded his vocals and the result is pretty awesome in my opinion as our deep and dark voices match pretty well. I’m also interested in another great song and videoclip Tausend Mann und ein Befehl. Can it be understood as some warning, that nowadays people don´t know what the price of peace is, and war is considered as something „fictive“ in far-away land? Dero: There´s peace within Europe since 74 years now and it seems that we´re taking everything for granted concerning freedom and democracy with which we should absolutely not negotiate with nobody if you ask me! On the other hand, the European governments recently installed digital surveillance systems in the internet which allow them to block persons and to erase content WITHOUT telling WHY! There´s been already lots of cases where people who were just criticizing policy or religion without using hate speech which is a definite sign for a beginning dictatorship! A very dangerous development as the first results are that there´s stall hundreds of pro-jihad-sites online while there´s more and more people getting blocked because of their critics toward religion! To me, this is a very scary sign! We´re on the „best“ way to modern dictatorships in the western world, that´s been shown pretty impressively in the novel „1984“ from George Orwell. On the other hand you see that there´s more and more people being fed up with the western tolerance towards religious intolerance and the reglementaion moloch packed with corruption and full of intransparence in Bruxelles. The „yellow vest“-movement in France proves that people in Europe are absolutely willing to get their power back! Next interesting song is TRRR-FCKN-HTLR. Do you think, that it is important role of artists to bring some tabooed themes to the light, because these topics are ignored by mainstream medias, politics etc.? Dero: To me, art is a perfect tool for on the one hand self-therapy and on the other hand reflecting bad parts of society in a provocative way. If you have a definite reason to provoke, it´s absolutely legit and needed in a free, enlightened and democratic society if you ask me. But as we must realize that there´s more and more critical free-thinkers getting blocked or banned from the internet, we also must recapitulate that even in a democratically Europe those in power feel and see that their end is near and so they desperately try and install totalitarian tools to supress the truth! OOMPH! will also play on a big tour across Europe. Could you tell us something more about it- what can fans await, ect.? Dero: We´re looking forward to be on tour during whole march this year all over Europe. As always, we try and deliver as much power, energy, enthusiasm and positive aggression on stage as possible. We´re going to be with 6 musicians on stage so that you´re going to feel the power of a live gig very intensely. Is it possible that we will see you in Slovakia sometime in the future? Dero: that would be a big dream come true for me, as I’ve seen in many documentaries that Slovakia is a very beautiful country. You have also played some concerts with orchestra. What kind of experience was it for you? Are you going to do that again? What do you remember of your musical beginnings? Have you ever thought about becoming part of a famous band? Dero: I wouldn´t consider „OOMPH“ as a „famous“ band, even though we´re pioneers of a certain genre and bands like Rammstein call us their main source of inspiration. I’m pretty fine with the fact that we´re a worldwide „known“ band, having in mind that you always pay a price for everything, even for being „famous“! One of the greatest things about your band is the fact, that you are totally unique. How did this idea of rich and with many-genre influenced music begin? Is it also due to your own personal preferences? Dero: as I’m a person that´s been interested in life, society, science, religion and politics since the beginning of my life, I still try and walk through life with open eyes and so I’m getting influenced and inspired permanently as I’m willing to also learn constantly. What’s you’re most favourite part of bands history? 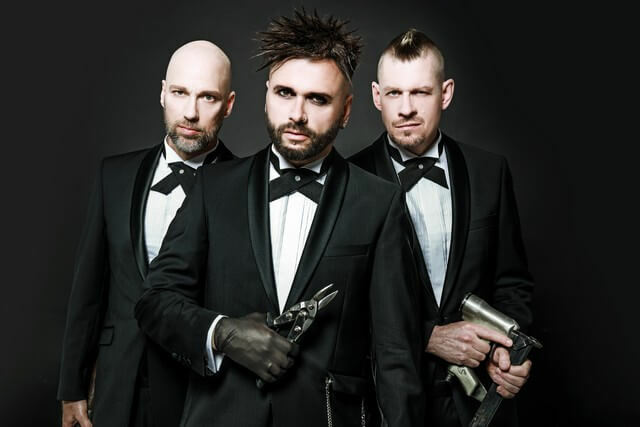 Dero: there´s far too many just to mention one single, but i guess that the „fall of the wall“ and „the reunification of Germany“ had the biggest impact on our band as we were also formed back in 1989! What are the main changes in the scene during these years? Dero: no doubt that the different platforms of distribution have heavily increased since the beginning of the internet. The game world has added a whole new dimension that is able to prevent gamers from being creative themselves, which is a bit sad in my opinion. There´s far more genres and subgenres at the moment as in the end of the 80ies. Dero: Thanks to you! It was a great pleasure! Hope to be able to come to your beautiful country asap.